We are a young couple from Romania, Ancuta and Cristian, and last summer we traveled from Romania to Morocco on our motorcycle. It was a wonderful experience, with a lot of stories to remember and of course, with amazing people. Long story short, we came to the conclusion that life is short and the things that matter to us aren’t an expensive car and a big house, so we started to travel full time. 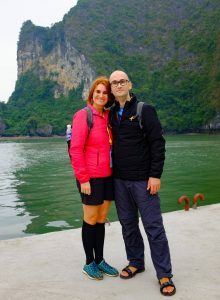 After the adventure on the motorcycle, we continued our travel through SE Asia for 5 months. Also, you can visit our Work with us page for more information. We write about useful things, about people that we meet, customs, tips and tricks, personal experiences and adventures, so don’t forget to subscribe to our newsletter.